We heard things like “they are sighthounds; they hunt their prey by sight” or “they can spot a rabbit at a distance of half a mile.” Those of us who have one or more hounds know very well that they can zero in on the most comfortable spot on the bed from any distance. The eyes of a Greyhound are amazingly sharp as well as wonderful windows into the emotions and heart of a hound. Unfortunately, a gaze into those beautiful eyes can sometimes reveal things that should not be there, indicating that something is wrong. 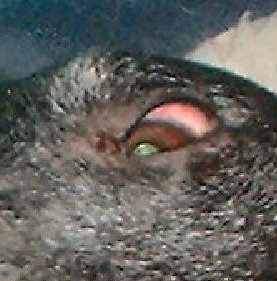 A couple of years ago I was looking over Skipper, the oldest of my Greyhounds, when I noticed a slightly opaque film covering a portion of his left eye. Thinking that this was the start of a cataract, I took Skipper to our veterinarian. He looked at it, said it might be pannus, and suggested a consultation with a veterinary ophthalmologist. Because the appointment with the veterinary opthamologist was not for another three weeks, I started researching pannus. The following is what I have learned from dealing with pannus in Skipper. Pannus is an immune disorder where the body thinks the eye is a foreign object and attacks it. This reaction of the immune system is manifested as a thin opaque film on the eye. Pannus is also known as Uberreiter’s disease. It usually starts in the corners of the eye and, if untreated, spreads over the cornea, eventually leading to blindness. Frequently, in addition to this thin opaque film, you will notice a mass of blood vessels that have spread into the cornea. You might also notice your pet scratching the eye, or that the eye appears red and irritated. However, not all these symptoms necessarily mean that the pet has pannus. Mechanical irritants in the eye, a physical defect of the eyelid, tear deficiency, and so on could cause these irritations. Pannus is a subclass of superficial keratitis. Superficial keratitis is common in all species and is characterized by corneal vascularization and opacification, which may be due to edema, cellular infiltrates, pigmentation or fibroplasia. If ulceration is present, pain, manifest by epiphora and blepharospasm, is an outstanding sign. Unilateral keratitis frequently is traumatic in origin. Mechanical factors, such as lid conformational defects and foreign bodies, should always be eliminated as possible causes since improvement will not occur until they are resolved. Ulcerative keratitis may be complicated by secondary invasion by bacteria, and in horses by saprophytic fungi. Bilateral superficial keratitis may be immune mediated or associated with a lack of tears, conformational defects, or infectious agents. A specific chronic superficial keratitis (Uberreiter’s disease, pannus) is a bilateral, progressive, proliferative, superficial keratitis that begins laterally at the limbus and eventually extends from all quadrants to cover the cornea. It is most common in German Shepherd Dogs. Specific therapy for superficial keratitis (SK) consists of topical antibiotics, antiviral or antimycotic agents when appropriate, removal of mechanical irritants when present, tear replacement when deficient and corticosteroids when immune mediated. The latter may have to be continued indefinitely and the frequency varied depending on the response. LuLu’s eye whites are now red. Interstitial Keratitis (IS) is a deep involvement of the stroma and is present with all chronic and many acute cases of anterior uvetis. The corneal neovascularization is deeper and less branching than in SK. If the endothelium has been disrupted, corneal edema is often marked. Systemic diseases such as canine hepatitis, malignant catarrhal fever, systemic mycoses and septicemias that localize in the eye, are causes for bilateral or unilateral IS. Therapy is directed at the anterior uvetis, the systemic infection or both. Ulcerative Keratitis (UK) may be superficial, deep, deep with descemetocele, or perforating. Pain, corneal irregularity, edema, and eventually, neovascularization are signs of ulceration. A dense, white infiltrate at the ulcer margin indicates strong leukotaxis and bacterial involvement. To detect small ulcers, topical sodium fluorescein may be required. In dogs most ulcers are mechanical in origin. All ulcers have potential for secondary bacterial contamination or endogenous enzamatic “melting” of the stroma. Therapy for superficial ulcers is usually medical, and consists of topical antibiotics, topical atropine for iridocycloplegia, and correction of any mechanical factors. The veterinarian will administer a series of tests and a thorough eye examination to determine if the pet has pannus. First, the veterinarian will determine if there is a foreign body in the eye causing the irritation. If so, the veterinarian will irrigate the eye with a sterile saline solution to remove any foreign body. If nothing is found, the veterinarian will look at the insides of the eyelids to see if there is a physical defect (a growth or imperfection) that is causing an irritation to the eye when the pet blinks. Assuming there is no physical defect the next thing to test for is “dry eye.” This test determines if there is a problem in tear production causing the eye to not produce tears. The test for dry eye is simple. The veterinarian inserts the end of a strip of sterile blotting paper between the lower eyelid and the eye. After about thirty seconds, the veterinarian removes the strip and checks the length of the wet portion of the paper. This will show if there is a problem in tear production. If this is the case, the veterinarian might ask you to use artificial tears and hope that the problem will go away in a week or two. If the problem is not “dry eye, at this point it is reasonable to suspect the dog has pannus. Don’t panic. Although pannus cannot be cured, it is controllable. The treatment consists of either eye drops or an ointment of a corticosteroid. However, there are some very important steps that need to be taken before putting these drops in the pet’s eyes. One of the most critical steps is to check the eyes for active corneal ulcers. If there is an active corneal ulcer it MUST be treated first before beginning to treat the pannus. This is because the corticosteroid medication might actually cause blindness if there is an active ulcer. The test for corneal ulcers is also very simple. The veterinarian will apply a dye onto the eye of the dog, and after a few seconds wash the eye out with saline. Next, in a dark room the veterinarian will shine a light into the eye of the pet. If there are active corneal ulcers, they will absorbe the stain and will be highlighted by the light. If there are no corneal ulcers, then the veterinarian will prescribe some pannus medication. If corneal ulcers are found, they have to be treated with a different medication and must heal completely before any treatment for the pannus can begin. What Medications Might Be Used? Pannus medications consist of either eye drops or eye ointment put into the pet’s eyes. The medication may be a combination of antibiotics and corticosteroids or just plain corticosteroids. Initially, when our Skipper was diagnosed with pannus, we used a combination antibiotic and corticosteroid called Neoperdif. However, Skipper was allergic to the antibiotic (he developed as a pink ring around the eye) so we switched medications and used only a corticosteroid. The medication Ax-Dex worked very well and soon we had the pannus under control. We have since switched medications to a generic corticosteroid (sodium dexamethasone) which also works very well. If the pannus cannot be controlled by a corticosteroid, there is yet another option available. The drug cyclosporin (an anti-rejection drug which suppresses the immune response) is used. This drug is more expensive than the sodium dexamethasone but is effective in instances where the corticosteroids don’t help. What Is the Most Effective Way to Apply the Medicine? The most important thing to remember about the application of the medicine is that it is the frequency of application, not the quantity that will give the best results. For example, suppose your veterinarian tells you to use three drops of the medicine in the eye every day. Rather than putting all three drops in the eye in the morning, spread this out over the day; one drop in the morning, one in the afternoon and one in the evening. Initially the medicines may have to be applied every day. Once the pannus is controlled the frequency might lessen to a drop every other day or even once every two to three days. It is important, however, to be very conscientious about applying the medication faithfully during the initial treatment. During the early days of Skipper’s pannus, we were using the eye drops every day. After we had the pannus under control, we extended it to every other day, and finally we were using the medication just once or twice a week. Ultraviolet (UV) rays seem to encourage the growth of pannus, so keep the dog out of direct, harsh sunlight whenever possible. This is particularly important when snow covers the ground and the sun reflects off the snow. Monitor the pannus by shining a light in the eyes of the pet to ensure that it is not getting worse. If it does seem to be getting worse, talk to your veterinarian about increasing the dosage. 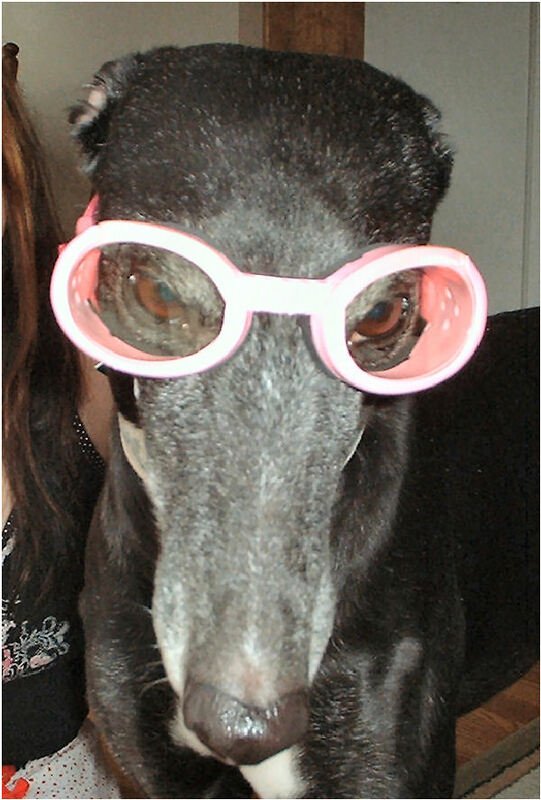 Therse Skinner puts LuLu’s Doggles on just before going outside. Pannus is most common among German Shepherds and not common in Greyhounds. * However, if you suspect pannus in your Greyhound, draw your veterinarian’s attention to it since he would not expect to find it in one. While we are dependant on our veterinarians for the medical needs of our pets, we as owners must be aware of the daily routine and condition of our pets and any deviation from these should be looked at carefully. With regular care there is no reason why your hound won’t be able to spot that rabbit from half a mile away. Where Can I Find More Information on Pannus? There are several places where more information on pannus is available. The following is by no means an exhaustive list but it’s a good start. The Merck Veterinary Manual, available online at amazon.com. Remember to click through http://www.adopt-a-Greyhound.org/treats/books-amazon.html so that The Greyhound Project, Inc. can profit from your purchase. 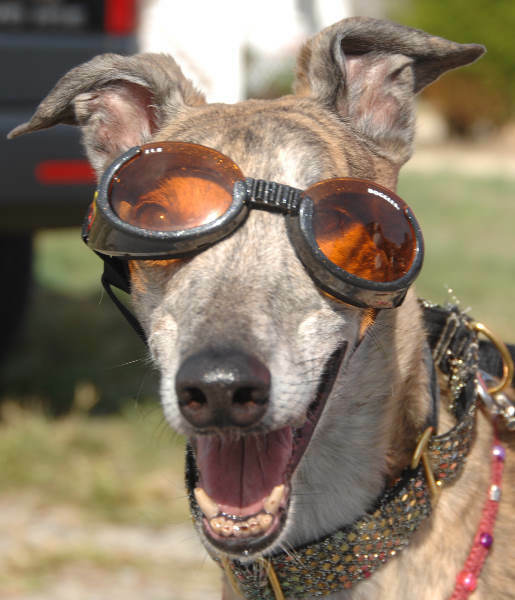 Care of the Racing Greyhound: A Guide for Trainers, available for online at amazon.com. You can also purchase it through the National Greyhound Association (NGA) at http://nga.jc.net/supply.htm or by telephone at 785-263-4660. An excellent pannus site is at http://www.animaleyecare.net/diseases/pannus.htm. Although originally published in CG Magazine Summer 2000, we think the information is still accurate. If not, please inform us of any must-changes.